This award-winning sculpture by Barnaby Evans installed on the three rivers of downtown Providence, has been praised by Rhode Island residents and international visitors alike as a powerful work of art and a moving symbol of Providence’s renaissance. WaterFire’s over eighty sparkling bonfires, the fragrant scent of aromatic wood smoke, the flickering firelight on the arched bridges, the silhouettes of the firetenders passing by the flames, the torch-lit vessels traveling down the river, and the enchanting music from around the world engage all the senses and emotions of those who stroll the paths of Waterplace Park. WaterFire Providence has captured the imagination of over ten million visitors, bringing life to downtown, and revitalizing Rhode Island’s capital city. Cited by the Providence Journal in 1997 as “the most popular work of art created in the capital city’s 371-year history” and by Friedrich St. Florian as the “crown jewel of the Providence renaissance,” WaterFire continues to grow and gain in popularity. Barnaby Evans created First Fire in 1994 as a commission to celebrate the tenth anniversary of First Night Providence. In June 1996, Evans created Second Fire for the International Sculpture Conference where it became the gathering place for thousands of participants from all over the world. Ardent art supporters convinced Evans to create an on-going fire installation and started a grass-roots effort to establish WaterFire as a non-profit arts organization. With the support of hundreds of dedicated volunteers, a hard working staff, generous donations from visitors, contributions from corporate leaders, and support from the City and State, WaterFire’s bright flames now regularly return to illuminate downtown Providence. In 1997, WaterFire Providence expanded to 42 braziers, and attracted an estimated attendance of 350,000 people during thirteen lightings. Evans received the Renaissance Award from the City of Providence for his work as an artist and his role in revitalizing downtown Providence. In response to growing attendance, WaterFire expanded in size to 81 braziers in 1998; and 97 braziers in 1999. 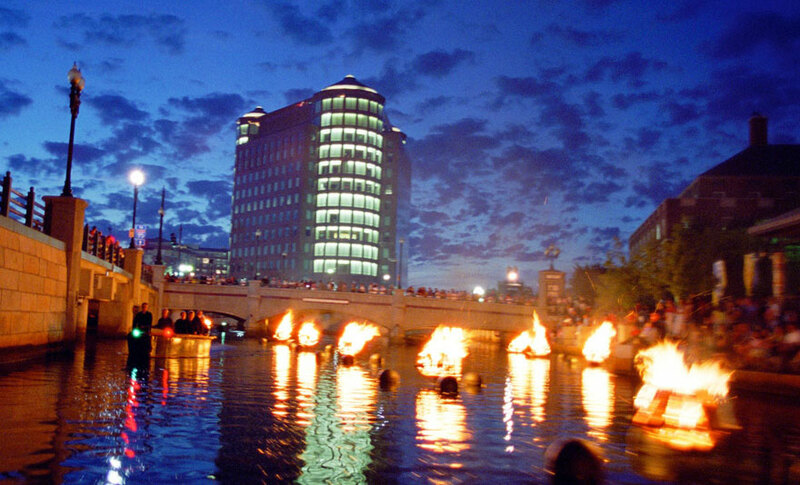 The 1999 season culminated with 100 bonfires in a special WaterFire lighting for the December 31 millennium celebrations. With WaterFire’s 2000 season more than thirty sponsors helped host 25 lightings during a season that ran from March to October. WaterFire celebrated its 200th lighting in August, 2006. In 2012 SmarterTravel.com designated WaterFire Providence as one of the Top Ten Great Destinations After Dark. 2014 marks the 20th anniversary of WaterFire lightings in Providence. Hundreds of volunteers devote thousands of hours and join with the fulltime staff to create WaterFire in Providence for your enjoyment. 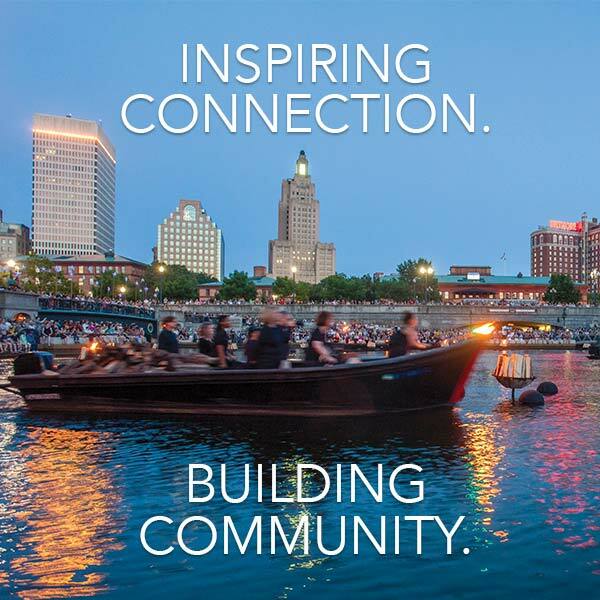 The power of WaterFire Providence to attract millions of visitors is eloquent testimony to the importance of public art and its capacity to restore our urban and social landscape. WaterFire Providence needs your support to keep the flames burning. WaterFire Providence is an independent non-profit arts organization and we need your contributions to present the event and cover our expenses. Please give what you can and give your donation to the volunteers at any of the stands in the park marked by the blue columns. Donations are also welcomed online.